Soon we are in my chambers again, sitting by the fireplace, glowing warmly, with the second box in my lap. I open it to search for the next object. Inside the box I find a large book. 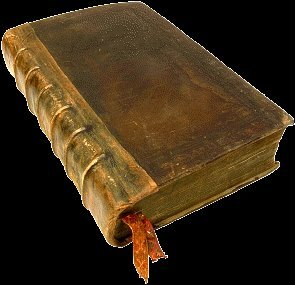 It is leather bound, with gold print that I cannot read. Perhaps a journal? I open it—it is a hand written cook book! A cook book? I have to laugh. After the recent events, it seems a strange object to find. As I examine it more closely, I see that the handwriting is my own! The recipes are familiar, many that I have developed myself! The book is almost full-only two or three blank pages remain. “Papa, please help e understand this,” I ask Him, truly uncertain of what to make of it all. He takes the book from me, flipping through it a moment, smiling. “This belongs downstairs, come, I will explain there.” He leads me back down the stairs towards the kitchen. We stop though, at the large shelf placed in front of the sealed basement door. Smiling, he carefully places the book on the self. As He says this, it seems I can only see the rows of empty shelves and the one tiny book from which to draw. I am so unprepared! “Papa, please, will you fill these shelves for me/” I stammer, feeling so inadequate. Together we walk down the hallway, through the foyer to the study. Still, it is my favorites place, I think. I love to listen, to hear His voice, just to sit beside Him and be in His presence. We sit beside the fire, He in the chair, I on the floor beside him. There are things weighing on my heart, heaviness from the day upon me. “Share your heart with Me.” He invites warmly, making me feel safe and welcome. “I’m not sure where to start.” I begin, but soon the words are tumbling forth unrestrained. It is easy to talk with Him. He listens to me, so closely, so attentively, I don’t know when I have been so truly heard.